When you register into any Social Media network, you have to give your personal information, like date of birth. Big thing? Yes, because it is the only information of you, which doesn't change. Everything else can. Good, now you can be traced later. 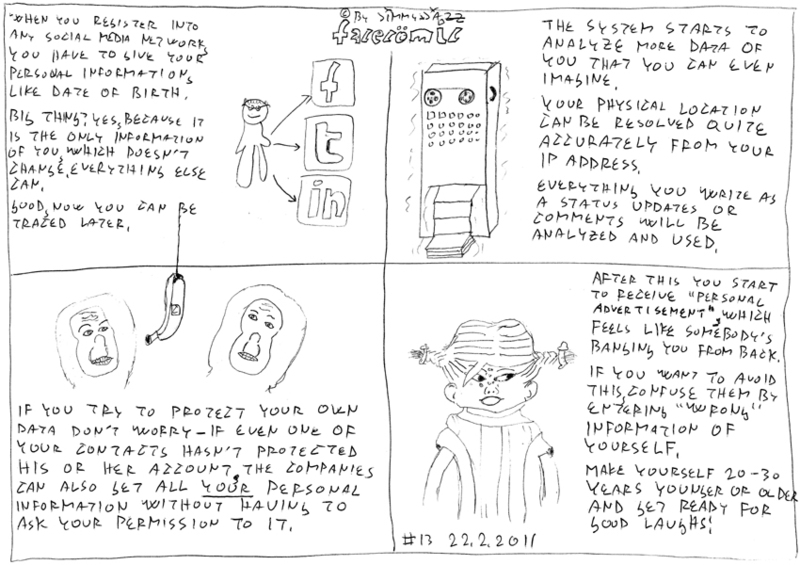 The system starts to analyze more data of you that you can even imagine. Your physical location can be resolved quite accurately from your IP address. Everything you write as a status updates or comments will be analyzed and used. If you try to protect your own data don't worry - if even one of your contacts hasn't protected his or her account, the companies can also get all your personal information without having to ask your permission to it. After this you start to receive "personal advertisement", which feels like somebody's banging you from back. If you want to avoid this, confuse them by entering "wrong" information of yourself. Make youself 20-30 years younger or older and get ready for good laughs!